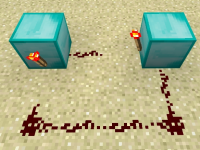 Redstone torches will create a clock circuit in certain cases, if the torch in the setup is broken and replaced. Compare the behaviour to the Java version. The circuit now acts as a clock. In example 1, the output of the comparator should simply cause the redstone torch to become unpowered, instead of creating a clock circuit. In example 2, the circuit should not begin acting as a clock.